When I was four years old, my mother was chopping vegetables for a stir-fry one night and introduced me to mushrooms by handing me an uncooked one. I nibbled it, determined it acceptable and myself an Eater of Mushrooms; I would like to tell you that my relationship with mushrooms has been splendid from that day forward, but the next day, in the backyard, it went south. I was playing with my sister and informed her, all-importantly, that I was a Mushroom Eater now, and proved it by plucking one from the ground and taking a bite. 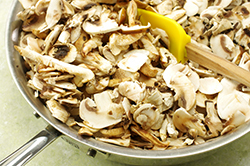 I was quick to learn – as my mother whisked me to the emergency room – that backyard mushrooms and grocery-store mushrooms are not the same. It turned out that, within my small four-year-old, curly-topped packing, there was a stomach – and a psyche – of steel, and both were immune to the urgency of the situation. I was later sent home, stomach contents and cheer intact, with the diagnosis that I was probably going to live. I don’t remember mushrooms much after that. It’s entirely possible that my parents decided that messing further with their younger daughter’s tenuous grip on common sense wasn’t worth it and didn’t buy them for a while. I next remember mushrooms from the 1990s, when wild mushrooms were all the rage on pizza and pasta, and I loved them as I had once before. This was also around the time I began to fall for savory dinner tarts, quiche compatriots that were a little less about custard, a lot more about the vegetables. A wedge of one with a big green salad was then and is to this day one of my favorite meals. These days, it’s also a bit of a savior, something that I can make on a Sunday and know we can enjoy it for light dinners until Tuesday. 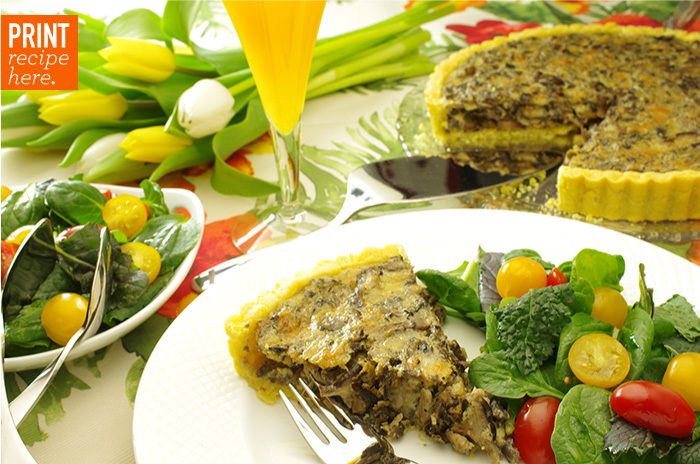 This version, packed with as many mushrooms as I could squeeze into a 9-inch shell, takes a haphazard tour of Italy with a cornmeal-enhanced crust and three cheeses. It got a little lost somewhere between Lombardy’s mascarpone, Reggio Emilia’s Parmesan, and Southern Italy’s provolone, and it’s not sorry – nor would I be, had I the chance to join it for its whirlwind tour. 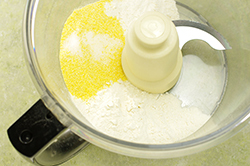 To Make Crust by Hand - In a large bowl, combine the flour, cornmeal, and salt. 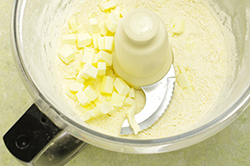 Work the butter into the dry ingredients with a pastry blender, fork, or your fingertips until only tiny bits of it remain visible. 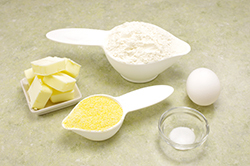 Add the egg, and mix with a fork until a dough forms. If this does not happen easily, toss the dough onto the counter and knead it briefly together. This dough can be rather tough, but with a little elbow grease it does come together nicely. 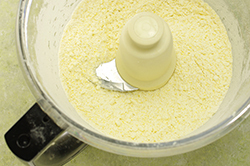 To Make Crust in Food Processor - Combine the flour, cornmeal, and salt in the work bowl of your food processor. Add the butter, and pulse machine on and off until the butter is in very tiny bits. 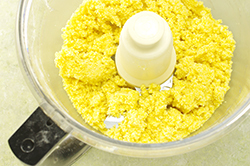 Add the egg, and run the machine until the dough starts to clump together. Form Crust - On a lightly floured surface, roll the dough out to a 12-inch circle. I find that rolling this dough between two pieces of plastic wrap makes it a cinch – just keep pulling out wrinkles in the plastic to keep it smooth. 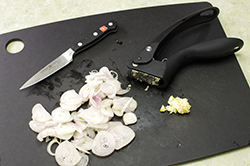 Once the dough has been rolled to the correct size, carefully peel back the top sheet of plastic, and invert the dough and bottom piece of plastic over a 9-inch fluted, removable-bottom tart pan. You can use the plastic and your fingers underneath to gently lift and lay the dough down centered in the pan. Once you’ve got the dough where you want it, carefully peel back the remaining piece of plastic, and press the dough against the bottom and sides. 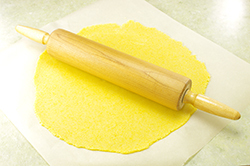 Run your rolling pin firmly over the top edge of your pastry pan to remove the excess dough. 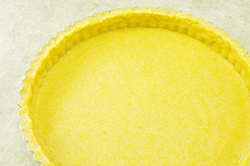 Place the tart pan in a baking sheet, and transfer to the freezer for 20 to 30 minutes. Parbake Crust - If you will be parbaking your crust, preheat your oven to 375 degrees. Once the crust is firm and cold to the touch, lightly butter one side of a 12-inch square of aluminum foil, and press the foil, butter side down, firmly against the base and sides of the crust. 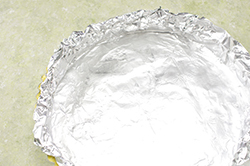 Bake with foil (no pie weights needed) for 10 minutes. Carefully remove the foil, and bake for another 5 to 8 minutes, until the crust is firm and lightly golden at the edges. Set tart shell on a cooling rack until needed. Reduce oven temperature to 350 degrees. 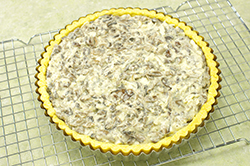 Make Filling - If you did not parbake your crust, go ahead preheat your oven to 350 degrees now. Heat a large sauté pan over medium heat, and add the oil and butter together. 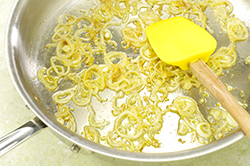 Add the shallots, and sauté, stirring occasionally, until they are soft, for about 2 to 3 minutes. Add the garlic and continue to cook, stirring, for 1 minute more. 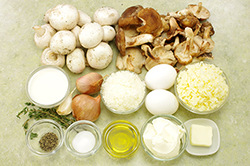 Increase the heat to medium-high, then add the mushrooms and thyme. 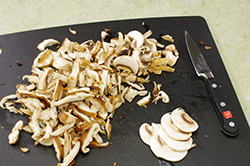 Of course, you’ll likely realize right now that you don’t have a chance of fitting your mound of mushrooms in the pan, but if you keep turning the cooked mushrooms from the bottom out over the uncooked ones on top, you’ll find that within a minute or so you have room for all of your remaining mushrooms. 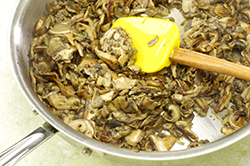 Sauté the mushrooms until they are tender and the liquid they release has been completely evaporated, about 9 to 10 minutes. Season with 1/2 teaspoon table salt and freshly ground black pepper, and transfer to a plate to cool. Scoop your mascarpone into a medium bowl. 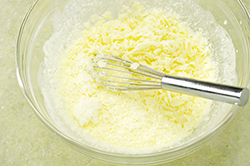 Drizzle in the milk, while whisking continuously, until the milk and cheese combine smoothly. (If you forgot to take your mascarpone out of the fridge, drizzle the milk in slowly while you whisk them together.) Whisk in the eggs. 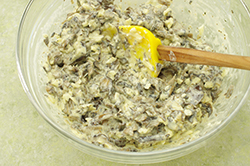 Stir in the provolone and Parmesan, then the mushrooms. 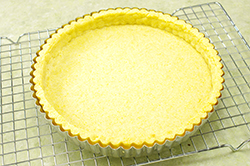 Bake Tart - Pour mixture into your tart shell, and bake for 35 to 40 minutes, until it is puffed and golden on top, and the tip of a knife inserted into the center and turned releases no wet custard. Let the tart cool for 10 minutes on a rack, and serve warm. It’s also delicious served at room temperature. Cooking Note - If you’ve got the time, you can parbake your crust to ensure it remains crisp. 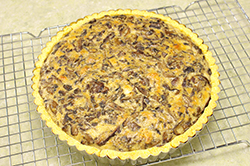 However, if you’re in a rush, you can skip this step and just fill the tart shell frozen. Because the dough has no water in it, I find that it keeps fairly firm and unsoggy, even with only a single baking.